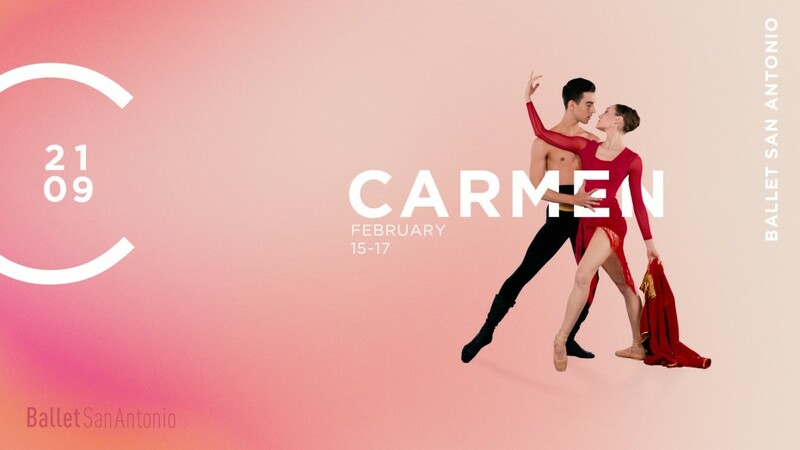 The story of Carmen, the sensual, fiery Gypsy girl that George Bizet elevated to iconic status, is such natural dance material that it is surprising to learn that no “Carmen” ballet had been created until 1949 when Roland Petit choreographed one for his company, Les Ballets de Paris. There have been a few others since then but San Antonio audiences will have the privilege to see a brand new, specially commissioned version choreographed by Cuban-born choreographer Yosvani Cortellan. Though he danced in other versions, this is Cortellan’s first opportunity to make his own interpretation of the story come alive on stage. Though two ballerinas – Sally Turkel and Sofie Bertolini – were supposed to perform as Carmen during the three-performance run, a week before opening night, the company announced that Turkel would not be able to dance due to an injury. So, all three performances will feature Bertolini in the title role. “Carmen” opens Feb. 15 at the Tobin Center for the Performing Arts. The story is familiar to most people from Bizet’s opera, which was based on a novella by Prosper Merimee, which, in turn, was inspired by a real situation the French author was told about when he visited Spain. We first encounter Carmen, a cigarette factory worker, at the market place in Seville, fighting with another woman. That’s when the military officer, Don José, sees her for the first time as well, as he crosses the market square with his fiancée Micaëla. He is instantly seduced by Carmen “sultry beauty.” What follows is a tale of passion, betrayal, jealousy, possessiveness and, yes, murder and pain, as Carmen becomes Don José’s lover only to nonchalantly turn her back on him when she meets the more flamboyant toreador Escamillo. The glorious music through which this dramatic tale is told in the opera is used for the ballet, too, but without singing, said Cortellan. Bertolini’s partners on Feb.15 and 17 will be Luis Corrales as Don José and Marko Micov as Escamillo, and on Saturday, Feb. 16, she will dance with Mayim Stiller as Don José and Michael Agudelo as Escamillo. Heather Neff and Kate Maxted will portray the sweet and abandoned Micaela. “It’s a great show for Valentine’s Day weekend,” noted Cortellan, who was a BSA soloist himself before becoming a dance faculty member at St. Mary’s Hall. We agree.